The best cross-platform mobile toolset refined to its core. 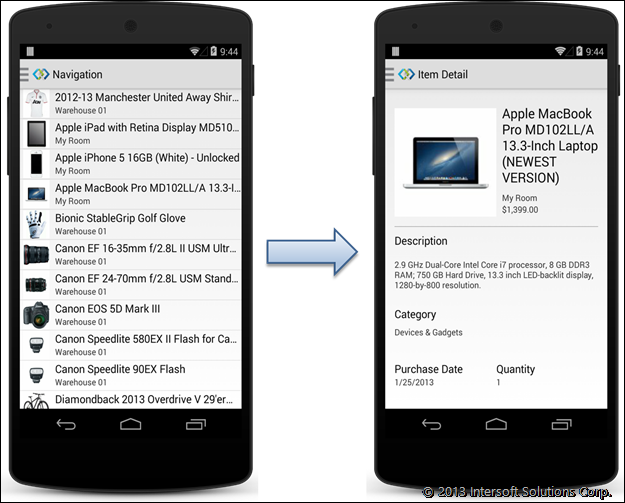 Two weeks ago, we released our SP1 milestone for Mobile Studio, bringing many new yet useful features such as the versatile navigation drawer for iOS and Android platforms. Today we have just released a more refined version of the the world’s most robust toolset for cross-platform development, with features that may not be plainly seen with the naked eye. In this post, we will cover many meticulous details such as elegant rotation handling for use with the Android navigation drawer and nested fragment navigation, updated navigation drawer samples, and also a delicate handling of the IsTransitioning state with the new left-edge swipe gesture and controller transition support introduced in iOS 7. Developers coming from the Android world will be familiar with the pain and frustration that we all share when designing apps for the Android platform, especially when fragments are used. When the Android device is rotated, the FragmentActivity as well as the Fragments are destroyed, which will then need to be recreated. Handled incorrectly, will result to incorrect app behavior that may confuse user and breaks overall user experience, not forgetting to mention how apps will crash more often. Crosslight for Android has been updated to address this issue, and developers will appreciate how all the intricate details have been taken care of. Now you will only need to focus on the ViewModel as well as the look and feel of their app, instead of having to handle the delicate rotation lifecycle. The ViewModels are now automatically persisted across rotation lifecycle, making sure that the screen view state and user’s editing session are correctly persisted when the FragmentActivity is recreated. Tested and proven on all form factors and orientation, this great time-saving feature will definitely shave weeks off your time table. Nested Fragment Navigation in Navigation Drawer. Previously, we have introduced the stunning and elegantly designed navigation drawer for Crosslight. Now, it has been updated to support nested fragment navigation as well as keeping the navigation stack intact when the user has navigated and the device is rotated, allowing greater user experience and flexibility of your app when using the navigation drawer. We have also introduced a new RightButtonDrawerId property for DrawerSettings in Android, allowing you to toggle the right navigation drawer using the action bar, if you wish to. The feature can be easily enabled by supplying the RightButtonDrawerId with the ID of menu item you wish to use as the toggle in the ActionBar. We also have updated our Facebook-style and Worthy-style navigation drawer samples to reflect the changes. Left-edge Swipe Gesture and Controller Transition Support for iOS 7. Since the introduction of iOS 7, Apple has introduced a new “hidden” gesture that most users might not be aware, which is the left-edge swipe gesture. iOS 7 has introduced a new state where the view is transitioning, which is now handled correctly. Changes to the view model will now take place when the view has completely transitioned, which means, changes will not be processed if the user swipes halfway through and returns to the editing page. The view is now also smoothly transitioned with fading animation during transition. This subtle yet important feature reflects our commitment to pay attention the smallest details that can give impact to user experience. 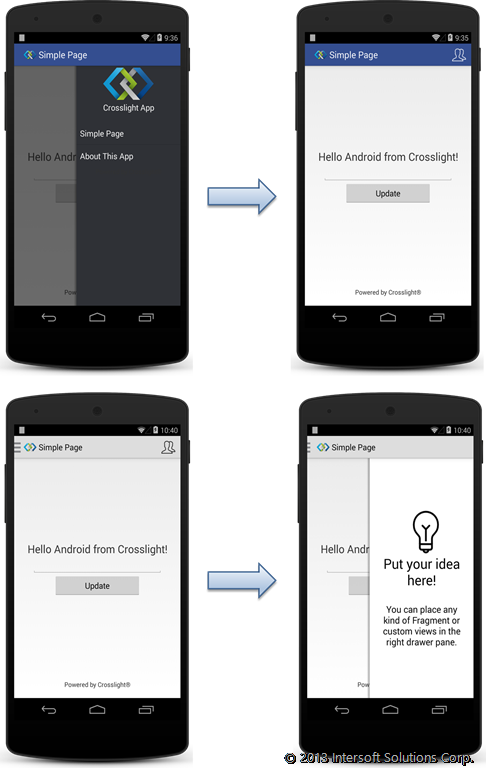 This update marks as the last and most stable version of Crosslight until the next major version is available. Sign in to your account to download the new December 2013 update today. In the next major release, Crosslight will ship the world’s first cross-platform data access framework with EntityContainer with tracking changes, async CRUD operation, async batch update, and much more . Supporting latest Microsoft technologies such as WebApi 2 and EntityFramework 6, Crosslight data service will provide advanced TT code generation as well as streamlined serialization and deserialization which were recently released, as well as support for transmission using OData. Stay tuned for more! Got questions? Feel free to leave a comment or start a discussion at our forums.